Check in with you family, friends & colleagues - MWAH R U Ok @ Work? Keeping an eye out for your friends and family will mostly feel intuitive, however often the concept of reaching out to a work mate and ‘checking in’ can feel a little more daunting. Concerns like – ‘am I overstepping the mark?’, or ‘will they think I am having a go at them?’, or even ‘will it damage our relationship if I ask?’. While totally normal, these are little ‘concerns’ that can stop us from asking our work mates “R U Ok?”, or “how are you doing”, when our gut says we probably (definitely) should. 45% of Australians between the age of 16-85 will experience a mental health condition within their lifetime (ABS). One in five Australian employees report their have taken time off work due to feeling mentally unwell in the last 12 months (Heads Up). 30 people attempt to end their life every day (Lifeline). In 2015, the suicide rate in Australia was 12.6 per 100,000 (Lifeline). Very sadly, suicide remains the leading cause of death for Australians aged between 15 and 55 (Lifeline). Looking at these numbers, it is a no brainer that at some points in our lives and careers, we will work with a person experiencing mental health challenges, or some days, we might even be that person. Beyond the stats let’s look at the human element of how we work. No longer are our ‘work’ and ‘life’ two completely separate entities that rarely interact. In fact the way we work now often means our team mates become our personal friends and confidants outside of the standard 9-5. Sometimes (scarily), we even spend more time with the people we work with than our own partner or family. Given this level of interaction, it is only logical we will sense when someone we care about at work is not doing so great, and may need a hand. This is not where we should stop short and pull up the imagined ‘work colleague’ barrier we too often hide behind when things feel a bit confronting. So how can you take the next step and actually have a conversation with a team mate that could actually change their life? There are a range of great tools and resources built by teams of mental health and wellbeing experts that you can use. 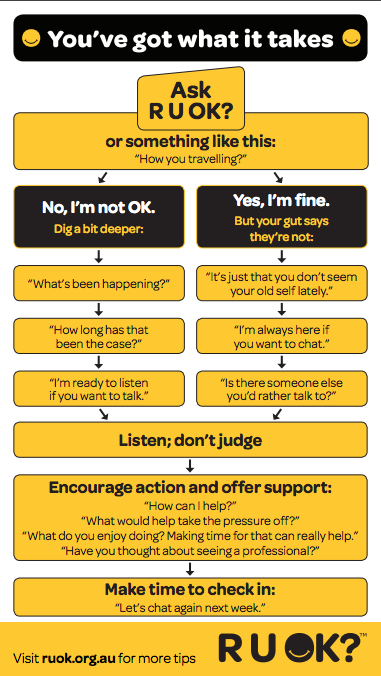 Given today is ‘R U OK Day’, we thought we would share the simple but effective approach created by R U OK to help you have a meaningful and comfortable conversation with a mate at work. Some last thoughts on R U Ok @ Work? It is important to remember, that nobody is ‘ok’ all of the time. There will be moments in each of our lives where we will need a little extra help or someone to talk to. At work, the simple act of caring about your team mates and keeping an eye out for them can be the thing that matters most. Here at mwah., we encourage everyone to be a little brave and ask that ‘R U OK’ question. You never know the difference you may make in someone else’s life if you do.